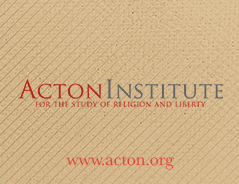 The Acton Institute for the Study of Religion and Liberty is a think tank whose mission is to promote a free and virtuous society characterized by individual liberty and sustained by religious principles. Named for the great English historian Lord John Acton (1834-1902), the Institute seeks to articulate a vision of society that is both free and virtuous, the end of which is human flourishing. To clarify this relationship, the Institute holds seminars and publishes various books, monographs, periodicals and articles.